What will this revelation mean for Rhee's campaign to promote her test-driven reforms? Her theory seemed to be that if she pushed incentives and sanctions hard enough, the scores would rise. Her theory was right, the scores did rise, but they didn't represent genuine learning. She incentivized desperate behavior by principals and teachers trying to save their jobs and meet their targets and comply with their boss' demands. Rhee's advocates point out that D.C. scores went up on the National Assessment of Educational Progress, the federal test. This is true, but the gains under Rhee were no greater than the gains registered under her predecessor Clifford Janey, who did not use Rhee's high-powered tactics, such as firing massive numbers of teachers. I think that this type of issue is another reason that making testing into such a high stakes gamble may be problematic -- it could massively incent poor behavior (at all levels). Furthermore, that a more humane approach had the same absolute level of improvement as the draconian approach is worth noting. I am sympathetic to arguments that education is important but it seems that dramatic reforms aren't really beating incremental reforms. I suspect that this behavior may be true of many complex systems (and learning is nothing if not complex) that are challenging optimization problems. This one's definitely worth a click. More extraordinary journalism from This American Life about how a small drug-related offense at the wrong place and the wrong time can have truly horrifying consequences. Ira reports from Glynn County Georgia on Superior Court Judge Amanda Williams and how she runs the drug courts in Glynn, Camden and Wayne counties. We hear the story of Lindsey Dills, who forges two checks on her parents' checking account when she's 17, one for $40 and one for $60, and ends up in drug court for five and a half years, including 14 months behind bars, and then she serves another five years after that—six months of it in Arrendale State Prison, the other four and a half on probation. The average drug court program in the U.S. lasts 15 months. But one main way that Judge Williams' drug court is different from most is how punitive it is. Such long jail sentences are contrary to the philosophy of drug court, as well as the guidelines of the National Association of Drug Court Professionals. For violating drug court rules, Lindsey not only does jail terms of 51 days, 90 days and 104 days, Judge Williams sends her on what she calls an "indefinite sentence," where she did not specify when Lindsey would get out. As the story notes, Williams' court is also unusually ineffective. I write for a blog called Observational Epidemiology. I actually look forward to listening to podcasts on math history. It's a wonder I date at all. Here's All Things Considered covering the Japanese nuclear crisis with a calm tone and meaningful context. Just pay the 99 cents, you cheapskate! A while back, This American Life did a piece on college partying. It's a fantastic piece of journalism and it's highly relevant to the debate over the impact, positive and negative, of colleges on the areas that host them. And while we're on the subject, our friend at Metaphor Hacker sends us another relevant radio piece (this time on the BBC). "The best report ever on media piracy"
You probably don't have time to read the entire 440 page report (I didn't), but you should at least clear out a few minutes for Salmon's sharp and insightful summary. This actually matches my experience with teaching quote well. Standardized tests are the only feasible way to handle large classes (how else do you assess 400 students?). But my best results come from asking essay questions (in free hand) and requiring many, many class presentations. Not only is the assessment a lot more complete but I gain a very good idea of what concepts and ideas that I failed to communicate well. This type of assessment is a valuable tool in making next years class better than the one before it (a process I hope never stops). Sadly, it is not well suited for mass comparisons between schools. But then complex phenomena rarely summarize well (just consider confounding by indication for how hard it is to use summarized data to capture complex processes). A few years ago, I was working on the roll out of a big project (think lots of zeros) for a company which will remain nameless for obvious reasons. Though impressive in many ways, the initial launch was set up in a way that seemed to preclude us from using most of the data that we had spent a tremendous amount of time and money acquiring. One day, toward the end of the project, I was having a few beers with one of the chief architects and I asked him point blank why they chose to set things up this way. His answer was (and I'm giving you this verbatim) "I remember we had a reason but I don't remember what it was." ...how the NY Times spent a reported $40-50 million writing the code (Bloomberg; other sources are consistent). Google was financed with $25 million. The New York Times already had a credit card processing system for selling home delivery. It already had a database management system for keeping track of Web site registrants. What did they spend the $40-50 million on? A monster database server to keep track of which readers downloaded how many articles? They should already have been tracking some of that for ad targeting. In any case, a rack of database servers shouldn’t cost $40 million. What exactly are the localized benefits of a university? I grew up in a small university town and I can say definitively it was a great environment. There were plays and concerts and speakers. When I started writing fiction as a high school sophomore, I got to sit in on a class taught by a well-established novelist. When I was a senior there was a program where I could take my remaining high school requirements in the morning and take college classes in the afternoon. I am, as you might imagine, a great supporter of colleges and college towns as is Joseph, my co-blogger. This puts us in an odd position. We are always looking for an excuse to promote higher education but the current line of argument about the economic benefits of universities at the local level is so weak and ignores so many counter-examples that it may do more harm than good. The focus on local benefits is almost fatally flawed from the beginning by the fact that most of the benefits accrue at the state or more often national level. Both innovations and people tend to flow with the market. When we fund research and produce skilled workers, the chances of a big long-term pay-off are very good but predicting the exact form and location of that pay-off is all but impossible. Keeping in mind that we are leaving out the majority of the return we expect on our investment, what benefits do we expect a university to provide to its host? First there are the soft benefits such as enriching an area's intellectual and cultural life, providing role models, enhancing reputation. Viewed from a high enough level, the soft benefits may turn out to be the far most important, but they are difficult to measure and plan around. For now let's focus on the hard benefits. Universities are often seen as an almost ideal industry -- pollution-free, creating a number of stable, middle-class jobs and generating charming, highly liveable neighborhoods. The problem here is that, if the suburban model takes hold and the town doesn't have a lot to recommend it outside of the school, the results can be really ugly, leaving the area with no tax base, an economy based on delivering pizzas and thousands of poor, badly-behaved students who get loud and drunk on Thursday night then head back to their parents' houses on Friday. How do you avoid this fate? One way is simply to stay small enough to maintain that Mayberry quality where it is possible for a professor to afford a decent little house within three or four miles from the school. I could give you some examples but while they may be charming, they aren't relevant to this discussion. Another solution is to have a university in a large, economically diverse town where the economy and quality of life won't be completely overwhelmed by the ebb and flow of the academic calendar. Unfortunately, even very large universities only have twenty or thirty thousand employees (academic and administrative). College Station can build an economy around a university. Seattle really can't. Call this the SAS model. Entrepreneurs who began as students and faculty decide to start some innovative new business just down the street. It's great when these things happen, but they don't seem to happen frequently enough, particularly not on the scale we'll need if we want to count on them to revitalize a stagnating city. To further complicate matters, this desire to start a business in the vicinity of a school is directly related to the appeal of the area (students who hate to leave a town are more likely to find a way to stay). The vibrant urban areas that are likely to attract these small businesses are the very areas that don't need them. This is probably the most commonly cited effect and it's certainly true that many of the more attractive industries require highly educated workers. It is not, however, so clear that these workers have to be in the area before the jobs are there or that the advantages of being able to recruit from an area college are that great. With only one very small nationally ranked school, Houston can't hope to supply itself with the first string academic talent it needs but that hasn't stopped its phenomenal growth (plenty of Ivy League grads are willing to move south), nor have the advantages of a local school caused Microsoft to focus its attention on UW instead of Waterloo. Universities are vitally important to our intellectual, cultural and economic future and they have paid for themselves many times over. They do not, however, have that great a record of revitalizing urban areas. It would appear that you need more than a "build it and they will come" attitude, that certain conditions have to be in place and, even with those conditions, the short-term magnitude of the effects may be less than we hope. Felix explains how the NYT paywall is like baseball. A good James Kwak column with a Joe Nocera link that might be worth using one of your twenty on. A worthwhile Worthwhile Canadian Initiative post. An sad story that would have been tragic if not for the amazing restraint and professionalism of the cops on the scene. Personally and pedagogically, I'm a big believer in finding new spots to drop the marble,* finding a different way of approaching old problems. This is particularly valuable when plateaus (defined here as periods of at best negligible improvement) are a concern. Variants are a good way to get new insights into old familiar games and keep things from getting stale. 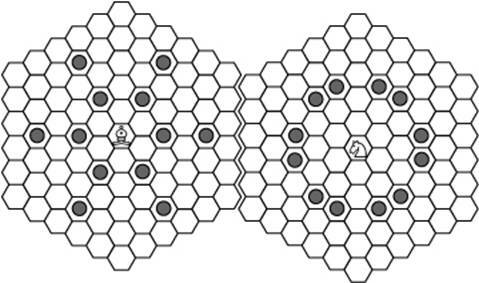 Some of the most interesting variants are based on replacing the square tiles of a standard chess board with hexagons. 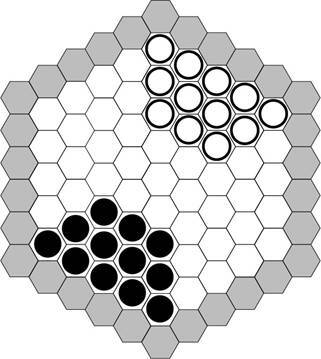 Most games played on an eight by eight rectangular board have been adapted to a six by six by six hex board (such as the one used for Agon). You can find game sets with these boards at many game stores (including mine) or you can create them yourself with pretty much any computer graphics program. The following list is by no mean exhaustive but it should be a good introduction. You can find complete rules for each game by following the links. As previously mentioned, Władysław Gliński's chess variant is hugely popular in Europe (more than 100,000 sets have been sold). I've played this one quite a bit and had a good time with it. You can probably figure most of the moves out for yourself. The only pieces that might give you trouble are the bishops and,to a lesser extent, the knights. Bishops come in three colors, which points out an interesting topological feature of a hexagonal grid which I'm betting you can spot for yourself. I believe Piet Hein himself may have come up with this variation on his game TacTix. There's a rather complicated intellectual property background to the game Reversi/Othello, but the game itself couldn't be simpler. 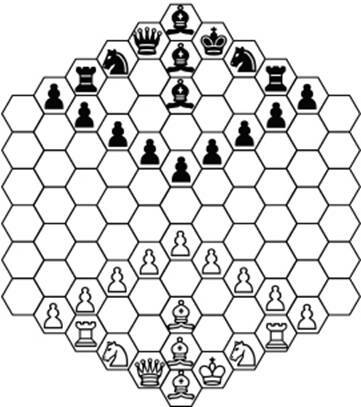 Here's one configuration for playing it on a hexagonal board. 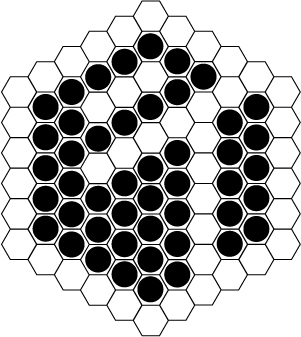 I wasn't able to find a standard version of hexagonal reversi. This version seems to work well but there may be room for improvement. * Always remember to flip your fitness landscape upside-down before dropping your marble. Energy landscapes should be good to go. For a more on this, take a look at "Fitness Landscapes, Ozark Style." But even the strongest cities can't -- and shouldn't have to -- handle the costs of urban poverty by themselves/ In the 1960s and 1970s, rich and middle-class city dwellers fled to the suburbs in part to escape having to pay the costs of addressing urban inequality. Rich enclaves have often formed right outside of urban political boundaries, where the prosperous can be close to the city without having to pay its taxes or attend its schools. A level playing field mans that people should be choosing where to live based on their desires for neighborhood or opportunity, not based on where they can avoid paying for the poor. -- Edward Glaeser, Triumph of the City, page 258. The difference between Seattle and New Haven is that the core of Seattle had managed to capture at least part of the prosperity that comes from institutions like the University of Washington and Microsoft. This suggests to me that there is at least a two stage process to using a university to enhance urban prosperity. It also suggests we might want to be leery about things like significant budget cuts as it would be foolish to risk disrupting these types of success stories. One of the reasons we have tenure is to protect the intellectual independence of academicians. If you think they no longer require that protection, you haven't been paying attention. Regular readers may recall my praise for William Cronon’s Nature’s Metropolis: Chicago and the Great West, a great book that had a big influence on my work in economic geography. Cronon has inspired many other people; Josh Marshall was deeply influenced by his environmental history of New England. Cronon, who teaches at the University of Wisconsin, is, quite simply, a great historian. He also feels some duty as a citizen, in particular a citizen of his state. So earlier this week he published an op-ed in the Times condemning the power grab by the state’s governor. And what happened next? Wisconsin Republicans have demanded access to his personal email records. Yes, personal. Cronon has a wisconsin.edu email address — but nobody, and I mean nobody, considers such academic email addresses something specially reserved for university business. Actually, according to Cronon he has been especially careful, maintaining a separate personal account — but nobody would have considered it out of the ordinary if he mingled personal correspondence with official business on the dot edu address. And no, the fact that he’s at a public university doesn’t change that: when my students take jobs at Berkeley or SUNY, they don’t imagine that they’re entering into a special fishbowl environment that they wouldn’t encounter at Georgetown or Haverford. Re our ongoing discussion of universities and economic growth, when we think of universities supplying skilled labor to specific companies, we generally expect the relationships to form primarily between businesses and nearby universities. That's often, but not always the case. This raises some additional questions about the University of Washington's role in Seattle's success. *For a somewhat different take on this relationship, take a look at this. Cancer survival is a valuable indicator for international comparison of progress in cancer control,despite the fact that part of the variation in cancer survival identified in this study could be attributable to differences in the intensity of diagnostic activity (case-finding) in participating populations. Here’s how I understand the over-diagnosis issue, in terms of an extreme example: suppose that there’s a form of cancer that kills people 7 years after it starts, and that there is in fact nothing you can do about it. Suppose that country A screens for cancer very aggressively, and always catches this cancer in year 1, while country B chooses to invest its medical resources differently, and never catches the cancer until year 4. In that case, country A will have a 100% 5-year survival rate, while country B will have a 0% 5-year survival rate — because survival is measured from the time the cancer is diagnosed. Yet treatment in country B is no worse than in country A.
I have resumed reading Edward Glaeser's book Triumph of the City. I am not always a fan of Dr. Glaeser's arguments but his discussion of urban sprawl is interesting, perceptive, and (I suspect) correct. The section is worth it for the discussion of Paris and alternative models of urban density alone. I am not convinced that he has modeled the predictors of urban prosperity well but I find his arguments for the drivers of sprawl to be compelling. I would be skeptical of any attempt to seriously engage the problem that did not consider these points. For example he references a fixed time cost to public transportation (waiting for the bus, traveling between destinations and stops) that puts the focus on car use in a whole different light. I was back to being impressed with his work in this section. The debate over job security for teachers is often employs an analog of the "If you're not hiding something..." argument in national security. Just as those who are guilty of nothing are supposed to have no reason to object to searches and wiretaps, teachers who are effective and conscientious have nothing to fear from the elimination of tenure and LIFO. The argument works on two levels: it has a convincing though overly simplistic logic and it casts aspersions on the competence and character of those who object to it. Of course, it collapses completely if those with the power to hire and fire ignore educators' accomplishments, make arbitrary and opaque decisions, play politics, let small factions gain undue influence over the process. Oyster-Adams Principal Marta Guzman can recall the ripple of anxiety that ran through some faculty members last summer when they learned that the new D.C. schools chancellor, Michelle A. Rhee, had chosen the bilingual school for her two daughters, a kindergartner and a third-grader. But Guzman, an educator with more than 30 years' experience, said she wasn't concerned. The dual-immersion program, where native English and Spanish-speaking children learn side by side, has long made the Cleveland Park school among the city's most coveted, with high test scores and a national Blue Ribbon for academic achievement. Every year, parents from outside its attendance boundaries vie through a lottery for a handful of spaces to enroll their children. "I thought it was a good thing," she said of the Rhee children's enrollment. This week, Rhee fired her. Guzman received a form letter from Rhee informing her that she was out of a job effective June 30, one of at least two dozen principals whose contracts for the 2008-09 school year were not renewed. Guzman said she was given no reason for her dismissal, either in the letter from Rhee or at a Monday meeting with Assistant Superintendent Francisco Millet. Guzman's departure has stunned many Oyster-Adams parents who wonder why, in a city filled with under-performing public schools, Rhee would sack a principal who has presided for the past five years over one of its few success stories. The move has also heightened ethnic and class tensions within the school's diverse community. Eduardo Barada, co-chairman of the Oyster-Adams Community Council, the school's PTA, said Guzman was toppled by a cadre of dissatisfied and largely affluent Anglo parents with the ear of a woman who was both a fellow parent and the chancellor. "I believe there are some parents who want to control and dominate," he said. "They want to silence the Latinos there." Claire Taylor, council co-chairwoman, said she "absolutely respects Eduardo's position" but doesn't agree with it. "From what I've seen of Michelle Rhee, she is an exceedingly fair person who wants what's in the best interests of the students," she said. Taylor added that ethnic and class divisions are the norm at Oyster-Adams. "A leaf falls and there are issues," she said. Taylor was one of a group of Oyster-Adams parents, both white and Latino, who dined with Rhee in November and aired complaints about Guzman. Among the issues raised with Rhee, who took notes, according to another attendee, were Guzman's alleged lack of organization, reluctance to delegate and sometimes-brusque style. Asked to discuss the dinner, which was at the home of another parent, Taylor said she was "not going to get into intra-school politics." The first sign that her job was in jeopardy, Guzman said, came last month, when Millet convened a meeting of Oyster-Adams teachers to discuss her leadership. Guzman, who was not invited to the meeting, said she learned from a teacher that Millet began the meeting by announcing that a national search was underway for her replacement. She quickly asked for a meeting with Rhee, who told her about the dinner meeting. Rhee said parents were frustrated by Guzman's lack of organization and "not comfortable with her" on a personal level. Maureen Diner, who has a fourth-grader at the school, said Rhee's silence is not seemly for a chancellor who came into office a year ago promising reform. "Anybody asked not to return deserves a process, at the very least a community meeting," Diner said. As for Rhee, "she talked about creating a culture of accountability. At the same time, she needs to be accountable for her own actions." I wish I could say I was shocked to read this, but I can't. I can't tell you that this sort of politics is unusual. I can't even claim that this is my first encounter with a dinner party putsch. At the risk of putting too fine a point on what is already a damned sharp spike, a group of parents who invite the chancellor of a major metropolitan school district over for dinner will not, as a rule, be poor, simple, honest workin' folk. They will tend to be wealthy, influential and grossly unrepresentative. To accept their invitation at all showed exceptionally poor judgement. To fire one of the district's most effective administrators based on their influence showed none whatsoever. Of course, under the current system, teachers have protections that principals don't. They can give poor grades for poor work, keep the wooden and the clumsy in the chorus and the second string respectively, write honest evaluations. They can, and often will, be harassed for doing their jobs but they aren't in danger of losing them. As Felix Salmon observes "Here’s the difference, Arthur: stealing a paper on 6th Ave is illegal." There are few debates more annoying than the perennial economics-as-a-science discussion. For one thing, it almost invariably prompts someone to bring out the old "look at our math" argument, apparently unaware that unnecessarily complicated mathematics is a standard trait of pseudo-science (just try talking to an astrologer or a relativity denier). Worse yet is the idea that being a scientist buys you a certain credibility, that your pronouncements should automatically be given weight because of the lab coat. (There's a reason the FDA doesn't let actors in drug ads dress as doctors any more.) A well-reasoned, well-supported argument from a historian still trumps a stupid one from a scientist. Having said that, the current debate is several notches above what I expected. Brad DeLong is asking some tough questions about economics not just as a science but as a discipline and we're getting some interesting and insightful comments from scientists in other fields. This time, it's a discussion worth following. I had started writing this post to complain about a waste-of-space article I had read about on a well-known blog, a complaint I would wrap up with a memorable George S. Kaufman anecdote. As I was looking up the quote, though, it hit me that there is nothing less necessary than journalism complaining about unnecessary journalism. So here's the good part. You can fill in the rest. I'm a big believer in more funding for education and research, but as for generating urban growth, the evidence is decidedly Glaeserian. Mark has been discussing Edward Glaeser and his comments on how universities Now, I am a big fan of universities and think that they serve an important role in global economic development. However, I am dubious that they make any particular community prosperous. Consider New Haven, CT -- the home of Yale University (recently ranked the #11 university in the world). According to wikipedia, the poverty rate in New Haven is 24%, which compares unfavorably with the rest of the United States where it is 14%. The poverty rate in New Haven, despite the presence of Yale, is nearly twice that of the United States as a whole. Now, one might note that many of the poor residents of New Haven are likely to be students. This is true. But these students still use municipal services and thus require the local tax base to support them (in addition to the long term residents). They do not (after they graduate and make additional income) send money back to New Haven so, in a sense, New Haven is actually subsiding the urban communities that Yale graduates move to. So, it is actually possible that a large university in a small community could be a drag on the economy due to the lower per capita tax base. Plus, you have a large segment of the population with only a short term interest in the community which may make long term planning more difficult. And New Haven, CT is not the only university town that I can think of with high levels of poverty. Furthermore, if a strong local university (like the University of Washington) is a solution to urban poverty (as it was presented in the Detroit versus Seattle comparison of Edward Glaeser) then it is unclear why a stronger economy has not grown up around Yale which is a strong school by any measure. Doesn't Alton Brown have a hand puppet for this? Andrew Gelman feels he may have the solution to the mystery of why Nathan Myhrvold (billionaire, physicist and former Microsoft CTO) became so fixated on solar cells acerbating global warming that he convinced the authors of Superfreakonomics to include an almost immediately discredited section on the subject. Gelman was referring to Myhrvold's writings on modernist cuisine (or what the slightly less trendy call molecular gastronomy) and specifically to this passage, "As browning reactions begin, the darkening surface rapidly soaks up more and more of the heat rays. The increase in temperature accelerates dramatically." This may explain why Myhrvold had albedo on his mind, but the comments to Gelman's post suggest another mystery: does the change in color actually have a dramatic effect the rate of browning or is the rate primarily driven by other changes such as water boiling away from the surface of the food*? Is it possible that Myhrvold is, at heart, basically a freakonomist? Someone who, though brilliant and accomplished, is so eager to find examples of important principles that he sees them where they don't apply? The following clip has nothing to do with anything in this post, but it does feature an exploding turkey which is really cool. High temperature, intermediate moisture levels, and alkaline conditions all promote the Maillard reaction. In cooking, low moisture levels are necessary mainly because water boils into steam at 212 °F (100 °C), whereas the Maillard reaction happens noticeably around 310 °F (154 °C): significant browning of food does not occur until all surface water is vaporized. One of the most effective rhetorical tools in the education reform movement is the "we're just in this for the children" chant. The implication, of course, is that the people who disagree with the movement's proposals must not be putting the children first. It is an obviously unfair suggestion but it done a spectacular job quelling potential criticism on the left. This concern does not, of course, preclude self-interest. As functional adults we expect people to act out of a mixture of motives. When policemen lobby for more cops on the street or our dentists advise us to schedule more appointments, we know that their advice to us is also in their self-interest but, barring evidence to the contrary, we believe that they are genuinely concerned about us as well. These two facts, that everybody has mixed interests and that their advice should still be given the benefit of the doubt, need be kept in mind during all debates. Acknowledging these facts goes a long way toward keeping things civil and, more importantly, honest. That's why, in the context of recent events, the behavior of Michelle Rhee has been so difficult to forgive. Rhee has always played an aggressive game and has gone out of her way to portray her opponents in a negative light, but with the formation of her lobbying group StudentsFirst, Rhee has crossed the line into claiming that only she and her allies have pure motives. The trouble with proclaiming your own purity is that someone will remember those proclamations when you have to make compromises. Rhee's recent role as an adviser/advocate for various conservative Republican governors has made some of these compromises unavoidable. Requiring superintendents to offer a written explanation for denying a teacher's contract renewal, if test scores and evaluations make the teacher eligible for the renewal. Let's take a minute and unpack this. First let's keep in mind that Rhee's philosophy is based on the assumptions that you can largely fix the current problems in education by putting better teachers in the classroom and you can accurately identify those teachers through test scores and evaluations. The teachers being denied these letters are, by definition, the same teachers Rhee says we need to keep in the classroom in order to save our school system. Unfortunately, the main effect of denying that letter will be to force many of these teachers out of the profession forever. As I explained it before, the problem is asymmetry of information. It is incredibly difficult and disruptive to make staffing changes during the school year. This makes administrators very skittish about hiring a teacher who has been fired elsewhere. The administrators would, however, probably take a chance if they knew that the teacher got good evaluations and produced high test scores but was fired for something like budgetary reasons. In other words, that letter might have determined whether or not the effective teacher remained employable. The effect here is two-fold: effective teachers who find themselves caught in this trap will have a great deal of trouble finding another job and may have to leave the profession; other effective teachers will see that competence and accomplishment cannot protect them from arbitrary career-ending decisions and will consider leaving the field as well. Either way, the law Rhee endorses causes us to lose more of the teachers Rhee says we need to keep. To be blunt as a sock full of sand, from the students' standpoint this is all bad. There is no possible benefit. You simply cannot argue that causing effective teachers to leave the classroom is good for kids. Despite Michelle Rhee's titular claim, rejecting that amendment puts students a poor second. This doesn't Rhee and the Florida GOP don't care about the quality of teachers (I'm sure they do), but it does mean that, in this case, other things mattered more. Things such as the money to be saved by firing teachers who are likely to max out the merit pay system and the power that comes from running the education department like a political machine. If Michelle Rhee were concerned solely with the interests of children, she would have been actively lobbying for rules like the one in the amendment, rules that furthered her stated goal of having more teachers in the classroom whom she considered competent. But, of course, Rhee has to balance the interests of children against the interests of those she represents, an alliance that includes, among others, educational entrepreneurs who stand to make a great deal of money from proposed reforms and conservative Republicans who see the current conflict as a way of maintaining political power and moving back to a period when the country was on the right track. I have no doubt that Michelle Rhee's concern for children is genuine. Rhee is a professional educator and it is exceptionally rare to find someone who has spent a career working in schools who doesn't care about kids. Nor does the fact that she has sometimes put other interests above those of students (including a particularly notorious case involving her own children) indicate a lack of concern -- making compromises is a necessary part of being an adult. The sin here is in the lie, in claiming purity of motive and suggesting that only she was trustworthy. That was unfair to her opponents, provably false and terribly damaging to the discourse. Michelle Rhee should be ashamed of herself for saying it and Guy Raz and the rest of the press corps should be ashamed of themselves for not holding her accountable. "How to Erase $70,000 in Debt"
You know, when Steve Martin and South Park did this sort of thing, they meant it to be funny. 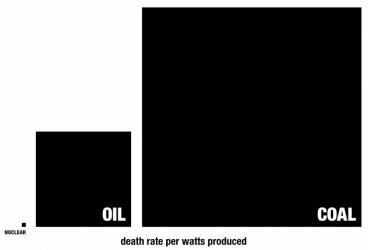 Here is an interesting discussion of deaths per terra watt-hour of electricity generated. I have always been surprised that coal plants generate more radioactivity in the surrounding community than nuclear plants do. I won't vouch for the numbers being perfect, nor do I think that these rates include the risk of massive failures (like a nuclear plant blowing up). On the other hand, the otherwise fairly safe Hydro has a disaster with 170,000 deaths included in it. This comparison does seem to put the relative level of risk in perspective. Certainly, there is no risk free alternative to power generation and we should really be focused on what non-fossil fuel options we might have. I'm running a dual boot operating system (Windows and Linux). Barring Doctorow's recently decanted telepaths, I assume that puts me up to forty a month which is about four times what I expect my monthly demand to be. Those advocating the end of seniority-based retention practices in favor of "performance" based on student test scores have to concede that districts, which must stretch dollars these days like never before, will be tempted to staff their classes in such a way to protect their younger (and, it must be noted, markedly cheaper) staff members. I will never forget in my third year on the job drawing a Freshman Geography class that felt, on bad days, like a training session for America's Most Wanted. When I half-jokingly teased a counselor about how I managed to draw every wild-eyed boy in the freshman class, she smiled and told me, "But, Steve, we all know how good you are with difficult students." At the time, I took it for the backhanded compliment that it was. In this brave new world being promoted by the GOP (and an alarming number of Democrats), it would be my ticket to lower pay. Worse yet, it could be my ticket out of the profession. The worry here is that, in the short term, this approach will save a lot of money. Having a lot of inexpensive and enthusiastic junior teachers will do wonders for budgets (at a time when tax cuts are a priority). While teachers will recognize what is happening, in an environment with unemployment hovering around 10% (and basic things like Health Insurance depending on employment) it is likely that schools will not suffer in the short term. In the long term, the new world of teaching will require much higher pay for equally qualified teachers as we know have to compensate the teachers for the fear and uncertainty in such a system. Not to mention to concern that class assignments could be used to protect liked but less capable teachers. Do we have a solid plan for preventing this from happening? Andrew Gelman joined in the Chess/Checkers debate and added Go to the mix (which was outside of the scope of the original post but is certainly relevant to the discussion). There have been around two dozen comments so far (and Gelman always has unusually thoughtful discussion threads). Definitely worth a look. Frances Woolley has a nice post about the intersection between tenure and the lack of a mandatory retirement age in Canada. It is a different case than the debate in Canada. The background is that salary scales and tenure agreements (at Canadian Universities) were negotiated when there was a mandatory retirement age of 65. The removal of mandatory retirement was a windfall for professors who were already employed as they work under a salary scale designed for workers who would leave at 65. Such a pay structure can be profitable as long as the pay structure is similar to the one shown in the diagram above, where the high costs of paying workers between 45 and 65 are counter-balanced by the low cost of paying workers between 25 and 45. But if the terms of the employment arrangement were changed so that workers stayed on until 75, the firm's pay structure would no longer be profitable: the costs of paying experienced workers more would exceed the gains from underpaying junior workers. I think that there is an important balance between job security and balancing out employment contracts. In this case, due to regulatory changes, I think it would make a lot more sense if tenure elapsed at the traditional retirement age. In this case we have the reverse of what is happening in the United States for teachers -- the employment contract changed in mid-stream. I think it is consistent to argue, in both cases, that a change of contract terms should not result in a windfall for either party unless the change was by mutual consent. As you've probably heard, there's a paywall going up around America's most over-rated newspaper (I'd put the Wall Street Journal, the LA Times and maybe a half-dozen other papers above it). The limit for free articles is twenty a month though you can still apparently follow blog links after you've run through those so you should still be able to keep up with most of what you're reading now (almost all of which is probably summarized by bloggers like Thoma and DeLong anyway). As far as I can tell, the big loss will be those articles that catch your eye while you're browsing the site and most of those tend to read like this piece on the spectacular failure of Mars Needs Moms (a bomb that may leave a nine-figure crater). It is quite rare for a Disney release to flop as badly as “Mars Needs Moms,” which is based on an illustrated book by Berkeley Breathed, best known for the comic strip “Bloom County.” Part of the problem may have been the story. What child wants to see a movie about his mom being taken away from him? But studio executives also pointed to the style of animation as a culprit. Do the names Bambi and Dumbo not ring any bells whatsoever? Does Barnes not know that early Disney features (Snow White, Pinocchio, Dumbo, Bambi) expertly played expertly on children's fear of being separated from their parents? Or that this template remains popular to this day (Finding Nemo)? More importantly, does this strike you as an insight you'd pay $15 a month for? If you're in the mood for more fun at the gray lady's expense, check out this amusing bit of mockery from Wonkette. Make sure to check out this post by Andrew Gelman. It's relevant to a number of big but underdiscussed issues in the education reform debate. School teachers would lose tenure and see future pay raises based on student performance under a politically charged package of education changes the Florida House sent to Gov. Rick Scott Wednesday on a straight party-line vote. The legislation will establish a statewide teacher evaluation and merit pay system in 2014 and do away with tenure for new teachers hired after July 1 this year. It also chips away at teachers' due process and collective bargaining rights. In the new system contracts need to be renewed annually. I am unclear how not offering an explanation for failure to renew (for teachers that test well) is an unreasonable requirement. After all, if we trust these test-based metrics than it should be perfectly reasonable to explain why a high performing teacher is being let go (e.g. drop in student enrollment at their school). If we do not trust these metrics to give an unbiased picture of how is an effective teacher then why are we tying pay so closely to these metrics? It just seems to be inconsistent. It is also unclear where any money for merit raises might come from in a state focused on tax cuts. Overall, I am underwhelmed. One of the fundamental tenets of the reform movement is the belief that we could fix all of our schools problems if, through big bonuses and wholesale firings, we could replace all of the lazy and incompetent teachers with great ones. Counterarguments generally point out that our metrics for identifying good teachers were unreliable and that, even with high-quality metrics, trying to restaff a major industry so that, say, 80% of the new recruits were in what had been the top 10% is simply not practical. But what if we moved past those arguments altogether? What if we could create perfect duplicates of any teacher we want and place them in a million classrooms? Surely that would do it, but who should we pick? How about Jaime Escalante, the teacher immortalized in the movie Stand and Deliver? Escalante was beyond question a spectacular teacher and he managed to build one of the country's most successful math programs in a very troubled urban school, Garfield High. By the end of his time at the school, he was teaching huge calculus sections (for HS) and producing better than a 90% pass rate on the AP exam. Only four schools in the country had more students passing the test. In 1991, he packed up his bag of tricks and quit Garfield, saying he was fed up with faculty politics and petty jealousies. He headed to Hiram Johnson High with the intention of testing his methods in a new environment. But in seven years there, he never had more than about 14 calculus students a year and a 75% pass rate, a record he blamed on administrative turnover and cultural differences. Jaime Escalante was a great teacher, but to achieve those amazing results at Garfield he had to be in the right place at the right time. He needed a compatible and supportive administrator and, more importantly, a unique and powerful bond with the student body and the community. Compatibility and rapport are difficult to measure and next to impossible to predict but they are often the difference between adequate and astounding results. In short, I was in heaven. Nordhaus’s paper was wonderful. (Sorry, for technical reasons I can’t put up a full version from my current undisclosed location.) But as it turned out, it was much too optimistic. Not his fault or mine: it was those Bureau of Mines circulars. What was wrong with those circulars? 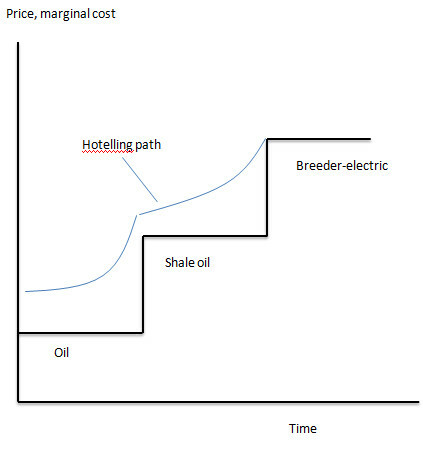 They were much too optimistic about the costs of alternative energy sources, especially alternatives to oil. Basically, the engineers were understating the difficulties involved. Later Marty Weitzman would formulate a law on this: the cost of alternatives to crude oil is 40% above the current price — whatever the current price is. And hence my skeptical reaction to the new study about the costs of running an all-renewable economy. To be fair, we probably have much more solid ideas about the cost of wind and solar power than we did about shale oil and coal liquefaction back in 1973: wind is already a widely used technology, and concentrated solar power — probably the main way we’ll use the sun — is pretty well understood too. But there will be surprises, not all of them positive. None of this is meant to disparage the work, or the need to use much more renewables than we are using now. We all occasionally make too much of anecdotes and jump too quickly from correlation to causality, but with Edward Glaeser, this sort of thing is starting to become a habit. Vast public infrastructure projects, like high-speed rail, helped create Spain’s current fiscal morass and did little to revitalize Japan during its lost decade. Of course, given the magnitude of the demographic and economic forces acting on Japan, it's difficult to say exactly what effect high-speed rail had. On the eve of the crisis, Spain was running a budget surplus; its debts, as you can see in the figure above, were low relative to GDP. Wouldn't Glaeser's argument imply that Spain was spending too much and wouldn't that, in turn, show up in the debt to GDP numbers? You need to follow stories like this. The Annotated "Evaluating New York Teachers, Perhaps the Numbers Do Lie"
As promised, here are some comments (in brackets) on Michael Winerip's NYT article on the city's teacher evaluation process. I've left quite a bit out so you should definitely read the whole thing. It's an interesting story but if anything here surprises you, you haven't been paying attention. "Jefferson is spinning in his grave"
There's nothing remarkable about this quote until you see why the speaker thought Jefferson would be offended. Michael Winerip is a much better than average education reporter. He doesn't have a great grasp of the numbers or of the implications of the policies, limitations which have kept him from getting a jump on the story the way, say, This American Life did with the financial crisis, but he has kept up with it while most of his colleagues are still reporting discredited narratives from interested parties. In 2009, Detroit public schools had the lowest scores ever recorded in the 21-year history of the national math proficiency test. The district had a budget deficit of $200 million. About 8,000 students were leaving Detroit schools each year. Wasteful bureaucrats. In 2009, the governor appointed an emergency financial manager, Robert Bobb, a former president of the Washington school board, to run the Detroit district. Mr. Bobb is known nationally for his work in school finance, and recruiting him took a big salary, $425,000 a year. He has spent millions more on financial consultants to clean up the fiscal mess left by previous superintendents. Greedy unions. Though Detroit teachers make considerably less than nearby suburban teachers (a $73,700 maximum versus $97,700 in Troy), Mr. Bobb pressed for concessions. He got teachers to defer $5,000 a year in pay and contribute more for their health insurance. Last week, the Republican-controlled Legislature approved a bill to give emergency managers power to void public workers’ contracts. If signed by the governor, Mr. Bobb could terminate the Detroit teachers’ union contract. Traditional public schools full of incompetent veteran teachers. Michigan was one of the first states to embrace charter schools, 15 years ago. Currently there are as many Detroit children in charters — 71,000 — as in district schools. Now there is talk of converting the entire Detroit district (which is 95 percent African-American) to charters. Supporters say this could generate significant savings, since charters are typically nonunion and can hire young teachers, pay them less and give them no pensions. So now, two years later, how are the so-called reforms coming along? Since Mr. Bobb arrived, the $200 million deficit has risen to $327 million. While he has made substantial cuts to save money — including $16 million by firing hundreds of administrators [Of course, he's spent millions making those cuts] — any gains have been overshadowed by the exodus of the 8,000 students a year. For each student who departs, $7,300 in state money gets subtracted from the Detroit budget — an annual loss of $58.4 million. Nor have charters been the answer. Charter school students score about the same on state tests as Detroit district students, even though charters have fewer special education students (8 percent versus 17 percent in the district) and fewer poor children (65 percent get subsidized lunches versus 82 percent at district schools). It’s hard to know whether children are better off under these “reforms” or they’re just being moved around more. Steve Wasko, public relations director for Mr. Bobb and the Detroit schools, did not respond to a dozen voice mails and e-mails seeking comment. Those who know Mr. Wasko say he cares about Detroit and is sick of the national media portraying the city as hopeless. Last spring, Mr. Bobb had planned to close 50 schools with dwindling enrollment. But his list was reduced to 30 after several public meetings at which parents and staff members pleaded their school’s case before the all-powerful Mr. Bobb. In June, Mr. Bobb held a news conference at Carstens Elementary — one of the schools spared — to announce the 30 closings. The school, surrounded by vacant lots and abandoned houses, serves some of the city’s poorest children. Thieves who broke into the school last year escaped by disappearing into what the police call “the woods” — the blocks and blocks of vacant houses. Yet Carstens students perform well on state tests, repeatedly meeting the federal standard for adequate yearly progress. “We try to fill in the holes in our children’s lives,” said Rebecca Kelly-Gavrilovich, a Carstens teacher with 25 years’ experience. Students get free breakfast, lunch and — if they attend the after-school program — dinner. To have more money for instruction, teachers sit with students at lunch, saving the school from having to hire lunchroom aides. Teachers hold jacket and shoe drives for children who have no winter coats and come to school in slippers. At Thanksgiving every child goes home with a frozen turkey donated by a local businessman. Twice a year a bus carrying a portable dentist’s office arrives, and a clinic is set up at the school so children can get their teeth checked. Despite all this, teachers worry that Carstens’s appearance on Mr. Bobb’s closing list — even though it was brief — means the end is near. Anticipating the worst, several parents have taken their children out of Carstens, enrolling them elsewhere, including at charters and suburban schools. Carstens’s enrollment is half of what it was a few years ago. Every hallway has empty classrooms, giving the school a desolate feeling. Mr. Bobb has set off a vicious cycle undermining even good schools. The more schools he closes to save money, the more parents grow discouraged and pull their children out. The fewer the children, the less the state aid, so Mr. Bobb closes more schools. Carstens has also been harmed by poor personnel decisions made by the district. Last year, 1,200 teachers took the retirement buyout, and Mr. Bobb laid off 2,000 others in the spring. Then in the fall, he realized he needed to hire the 2,000 back, and chaos ensued. At Carstens, a kindergarten class of 30 had no teacher until October; teachers at the school took turns supervising the class. “How do you think parents feel when there’s a different teacher every day?” said Mike Fesik, the current teacher. It’s hard to understand why any teacher who could leave Detroit stays, but they do. Kim Kyff, with 22 years’ experience, is one of the lead teachers at Palmer Park, the elementary and middle school that opened last fall. In 2007 she was the Michigan teacher of the year. She has had offers from suburban schools, but stays because she believes that in Detroit, she has a better shot at being a beacon of hope. Does anyone out there know Michael Winerip?